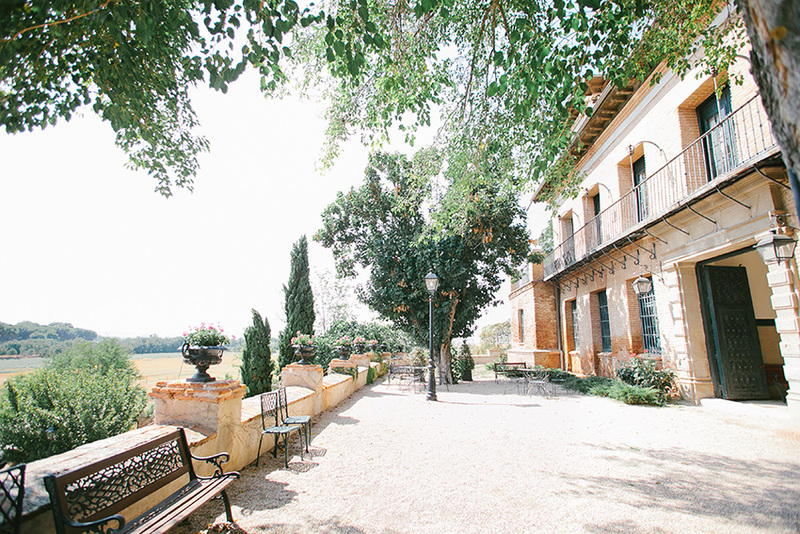 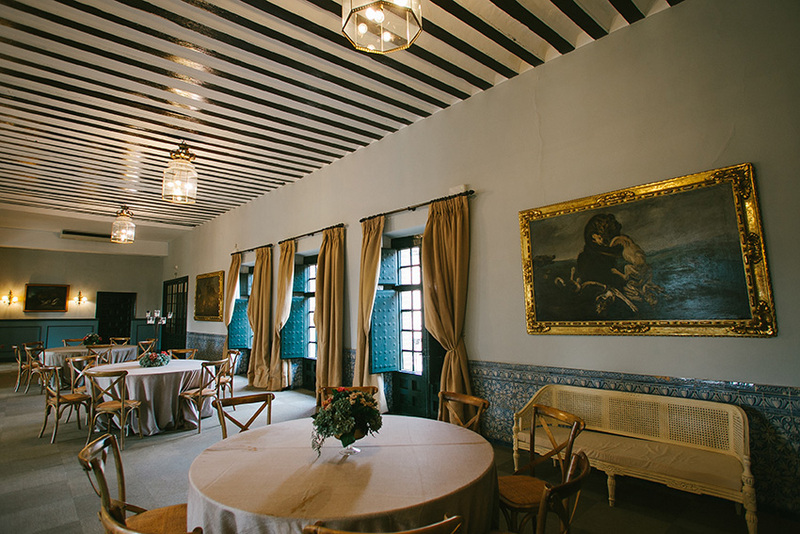 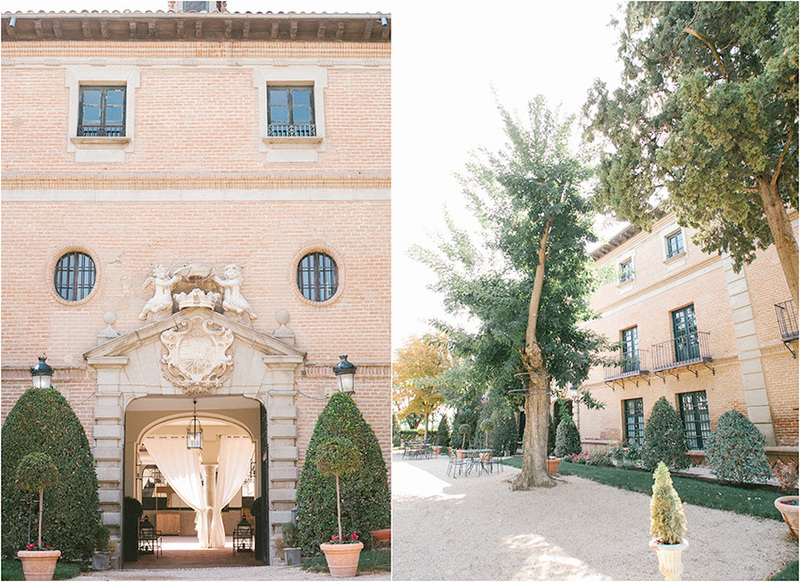 The Palace of Aldovea is one of the most spectacular places to celebrate a wedding in Spain because it’s a classic and it’s full of history. 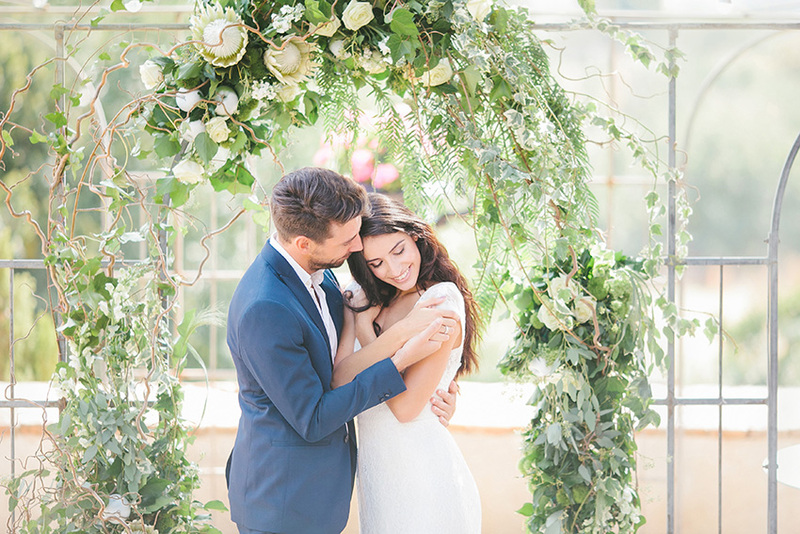 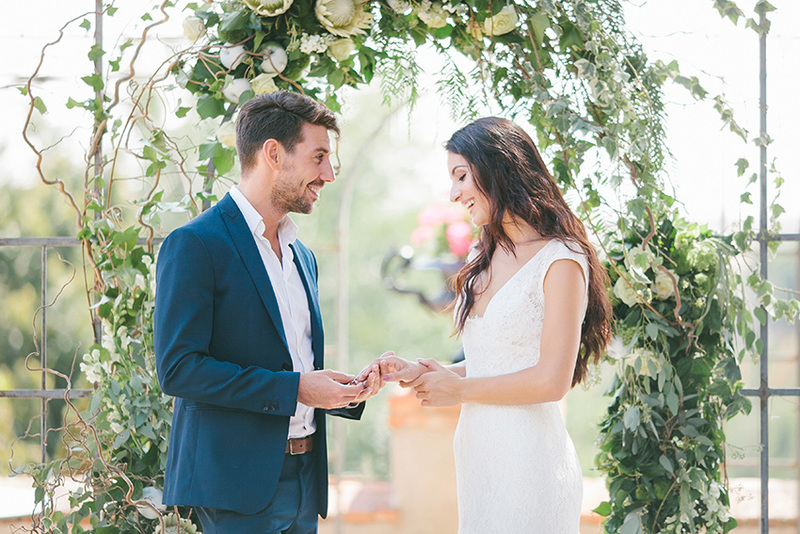 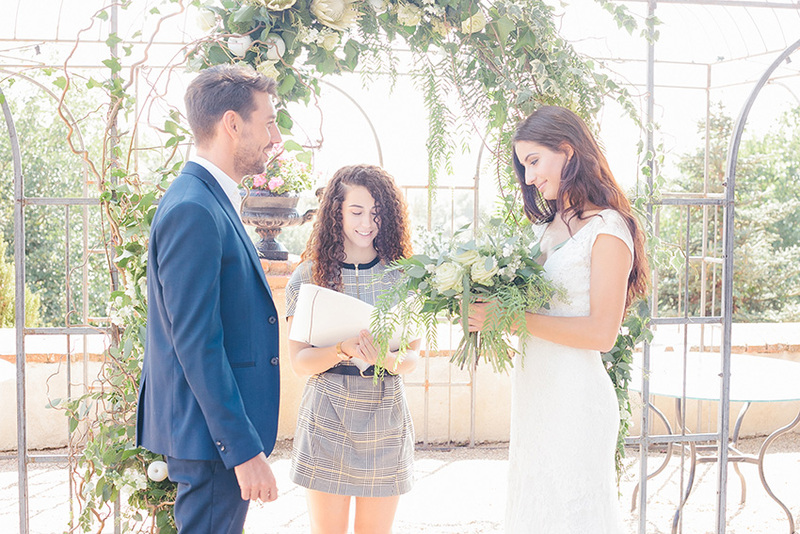 In this article, we’re going to show you one of the projects we’re working on this season, which we hope will inspire those of you who are planning a wedding for next year. 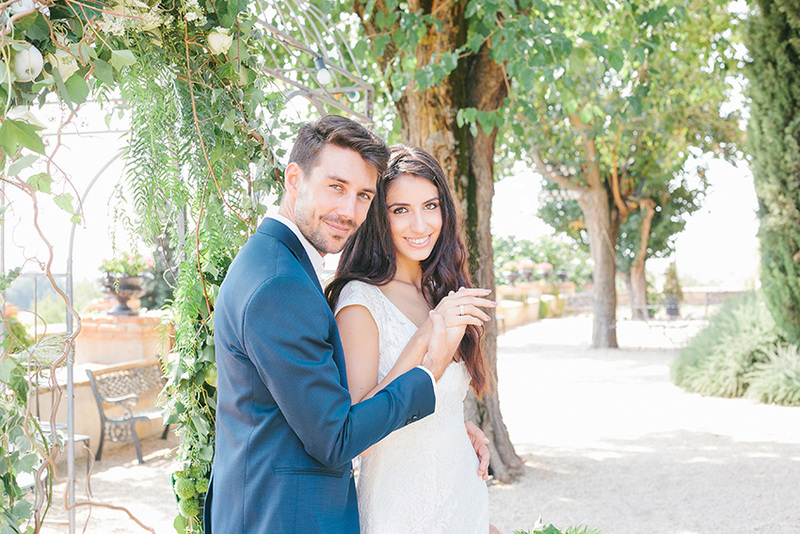 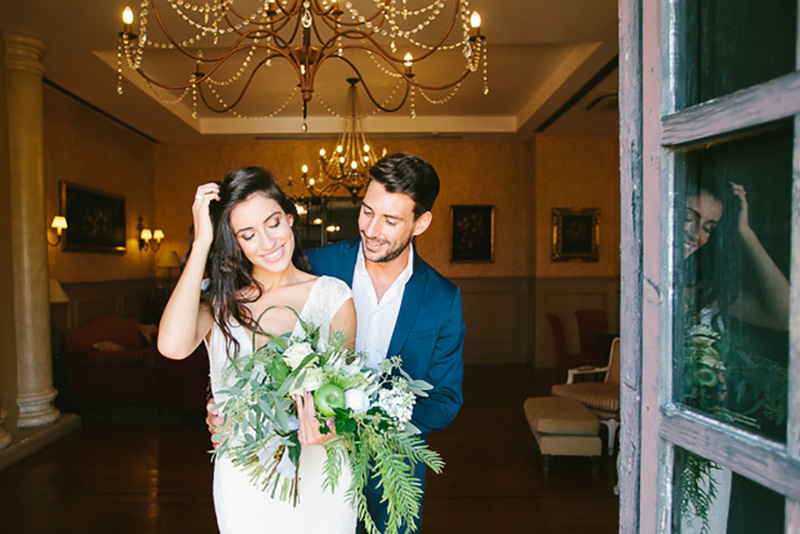 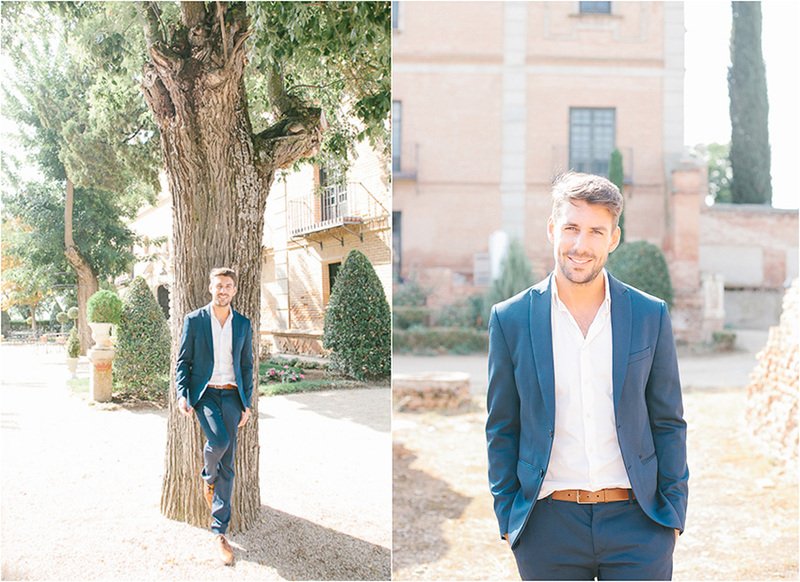 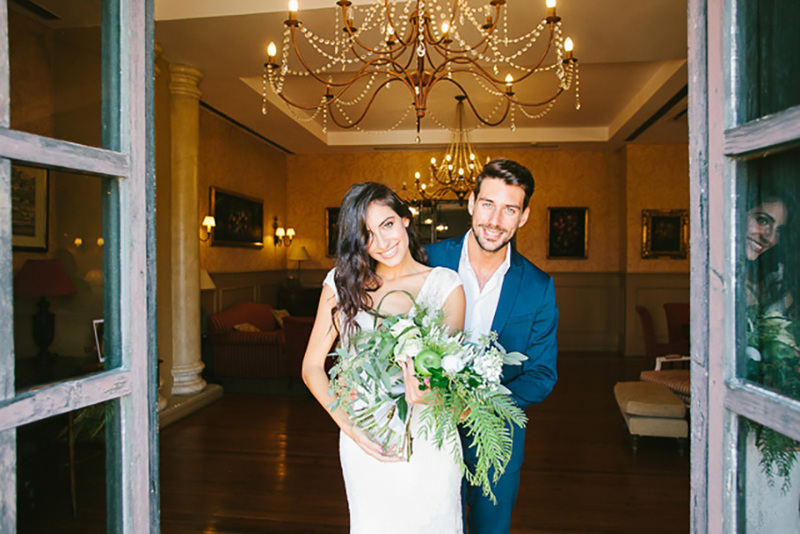 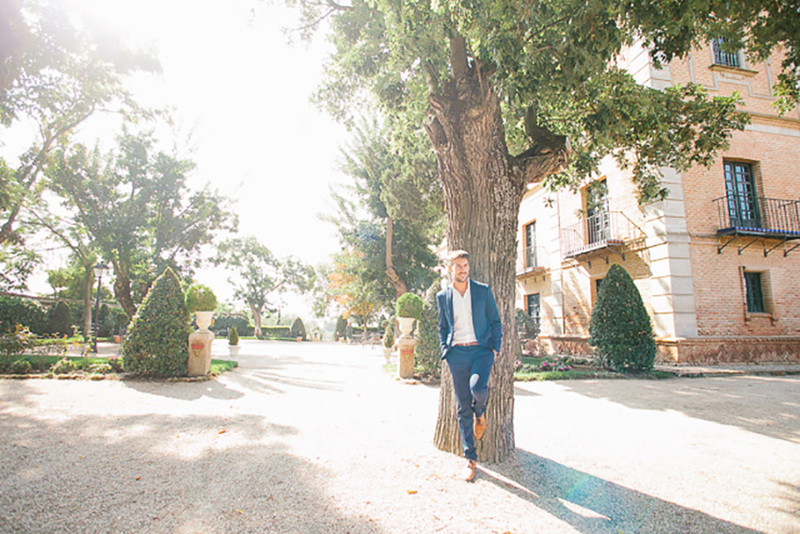 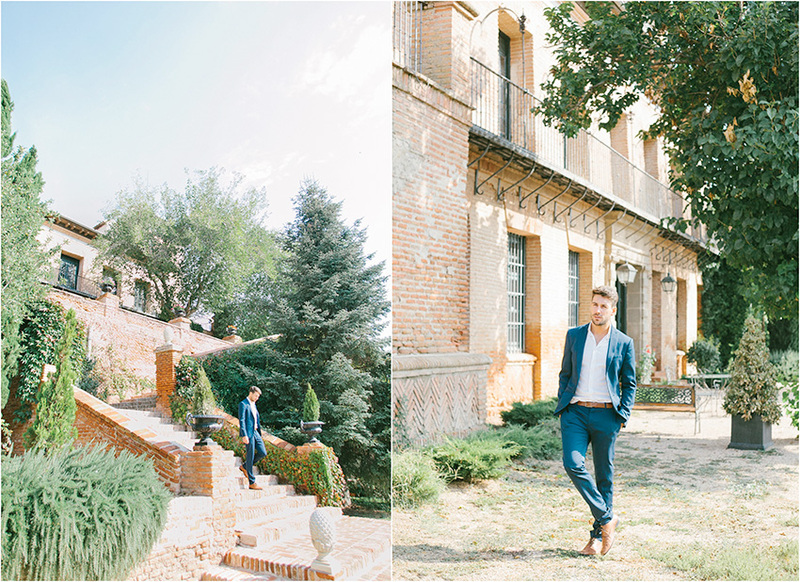 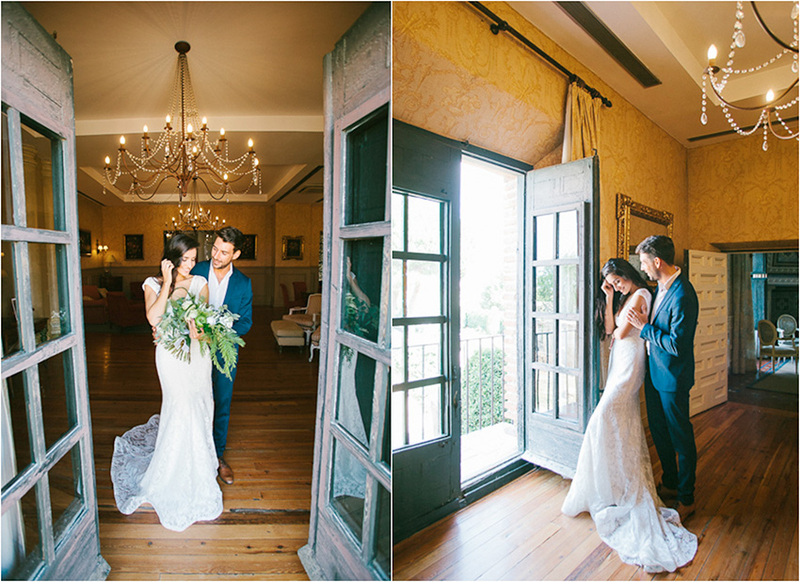 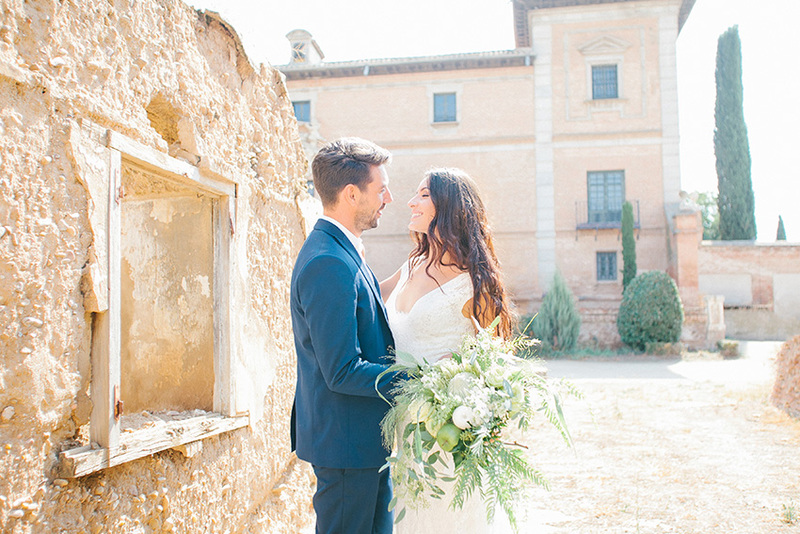 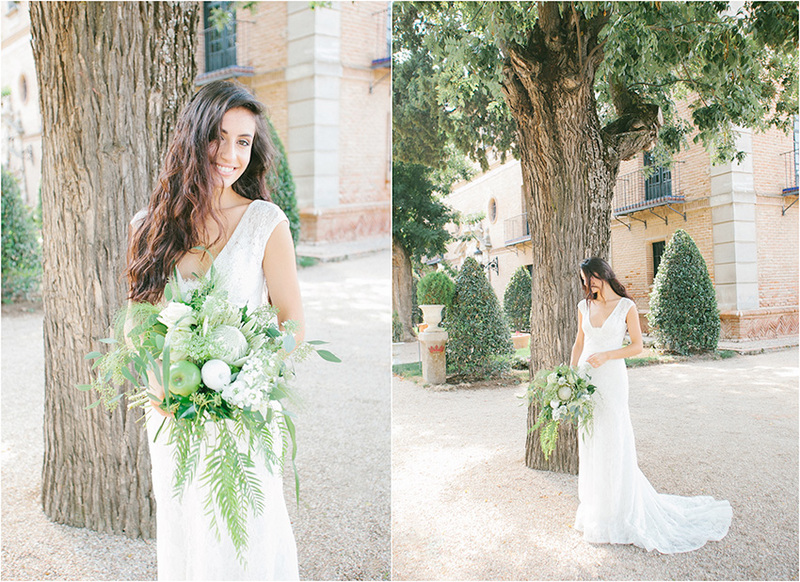 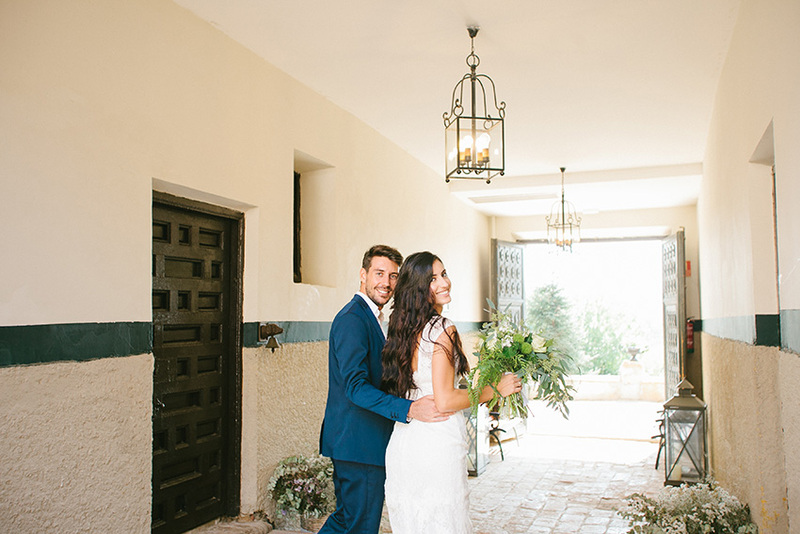 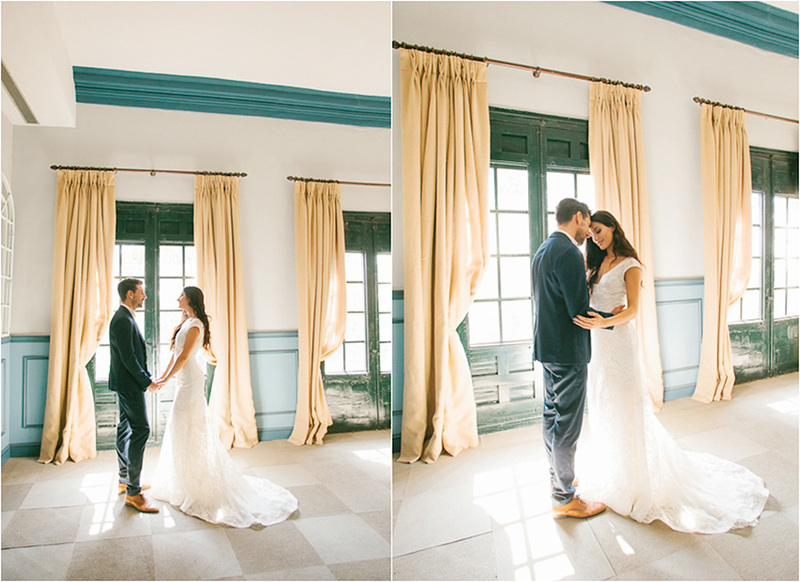 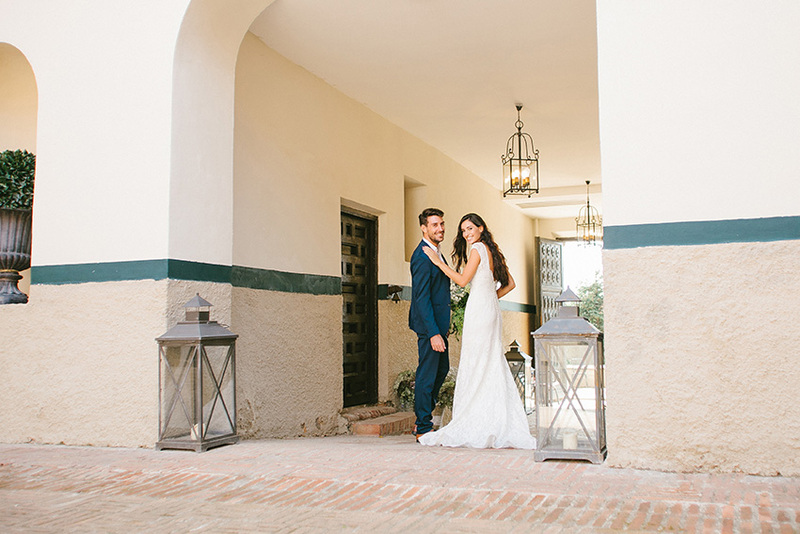 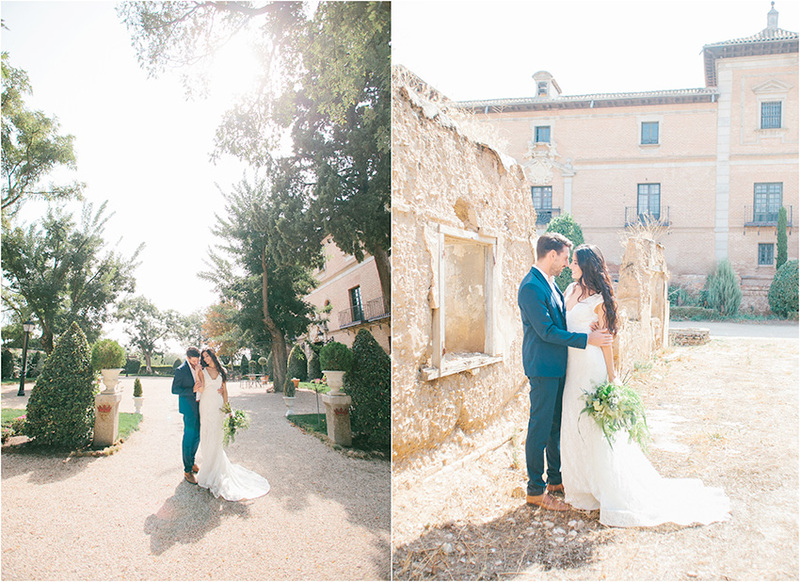 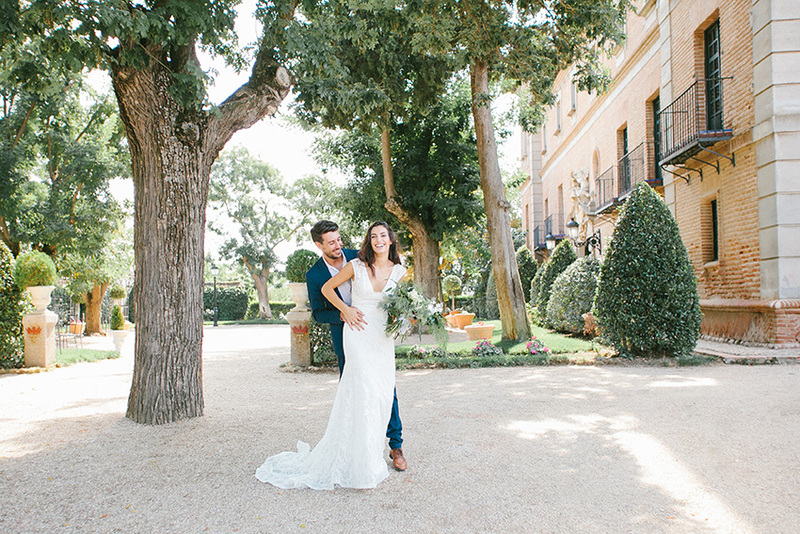 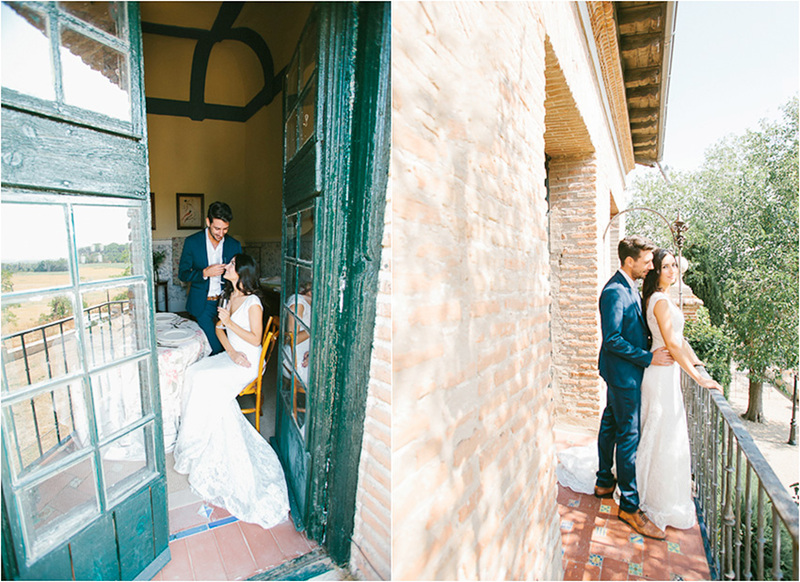 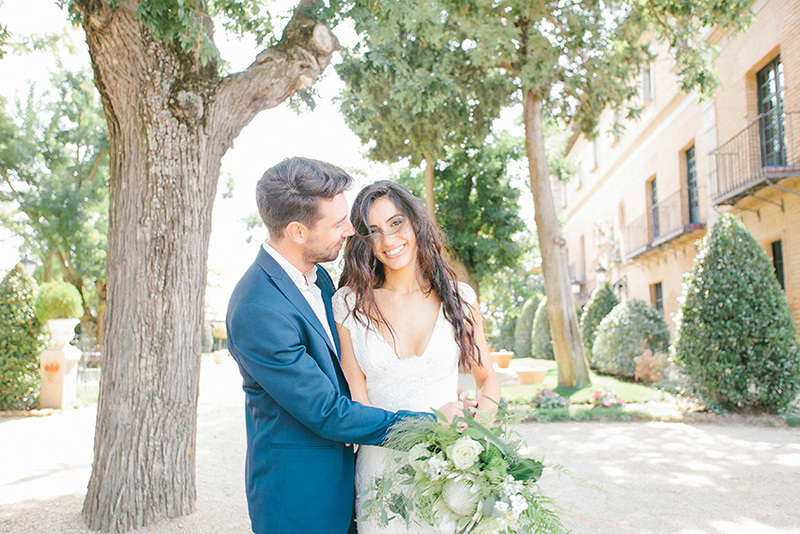 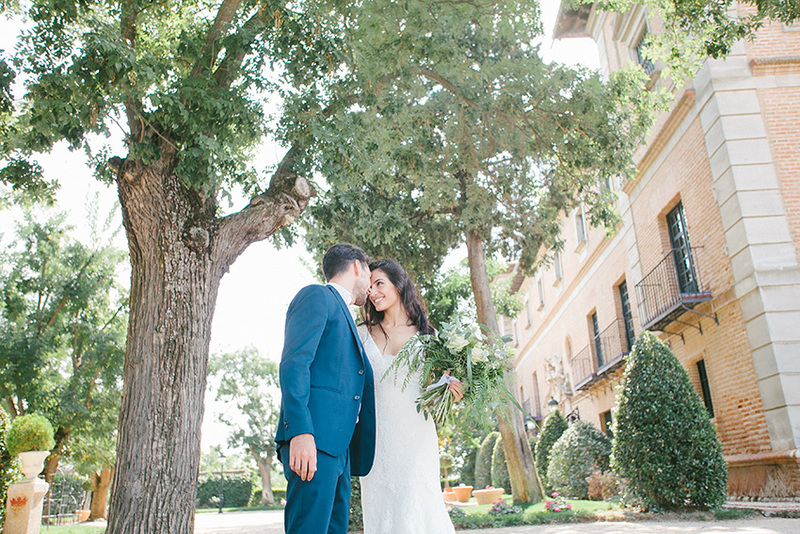 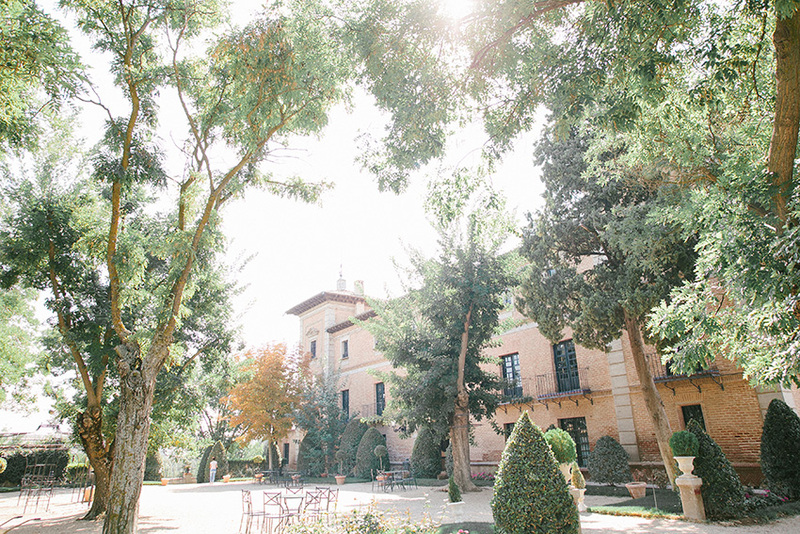 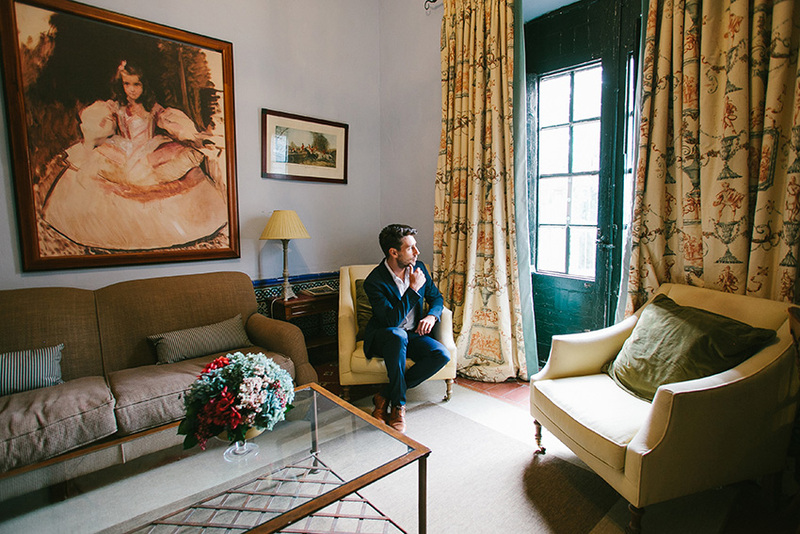 For this wedding in the Palace of Aldovea, the bride wore a Jesús Peiró dress, a brand which is celebrating its 30th anniversary in bridal fashion in 2018. 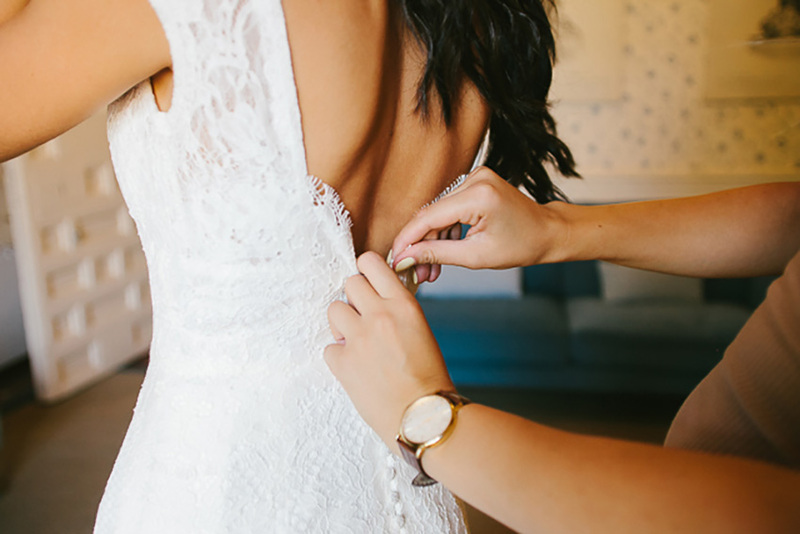 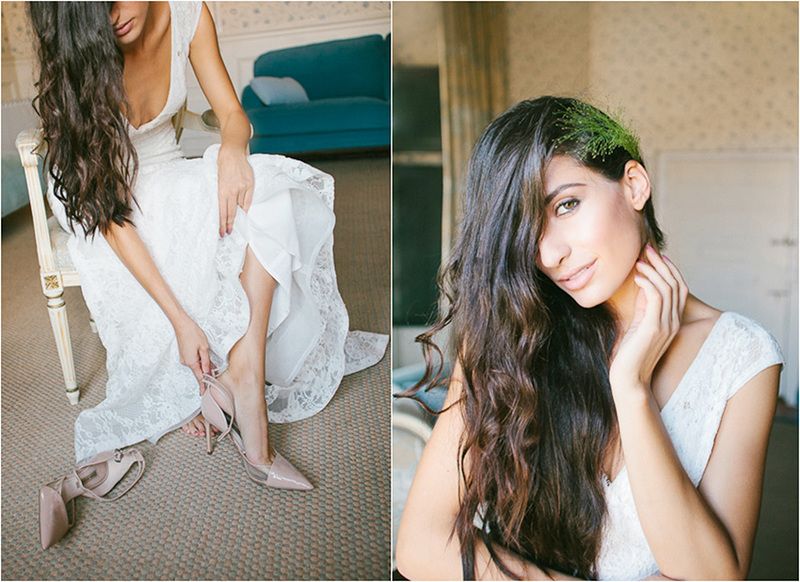 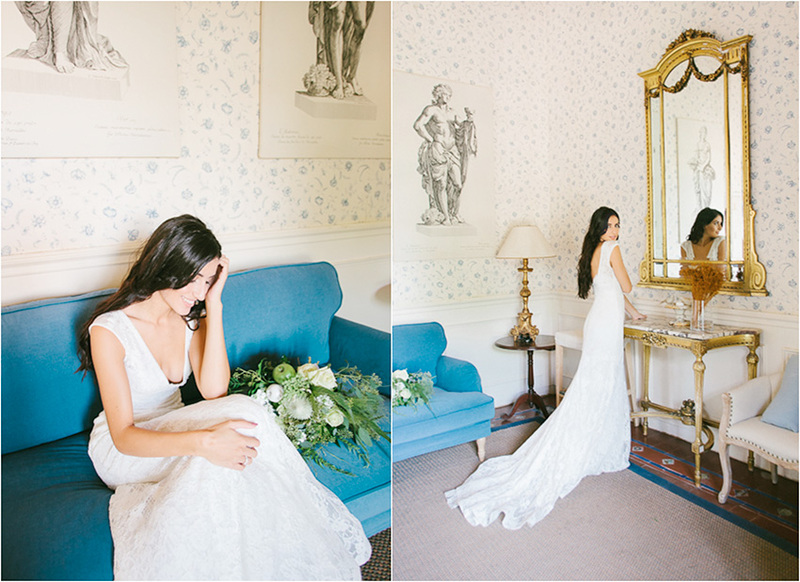 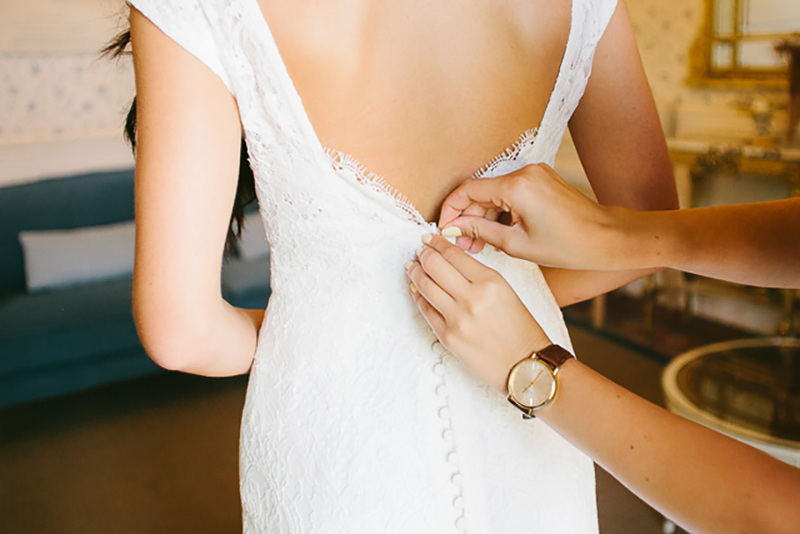 Everyone thought the bride looked beautiful in her chosen design, which was made with an incredible lace. 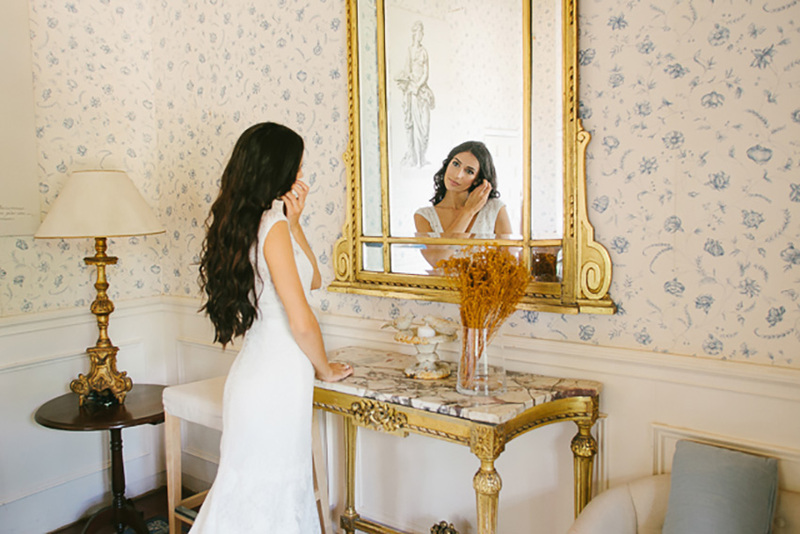 Her loose, wavy hair gave her look an added touch of elegance. 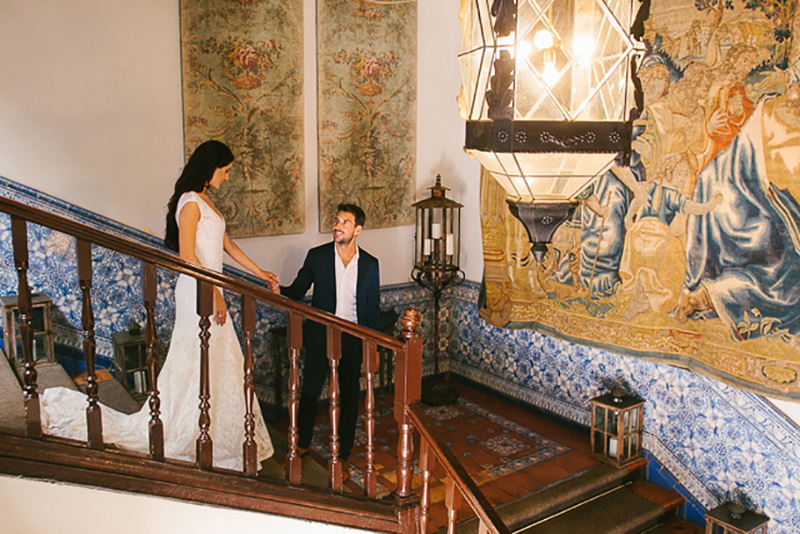 Despite the palace’s traditional style, the couple did not have to follow the trend with traditional accessories. 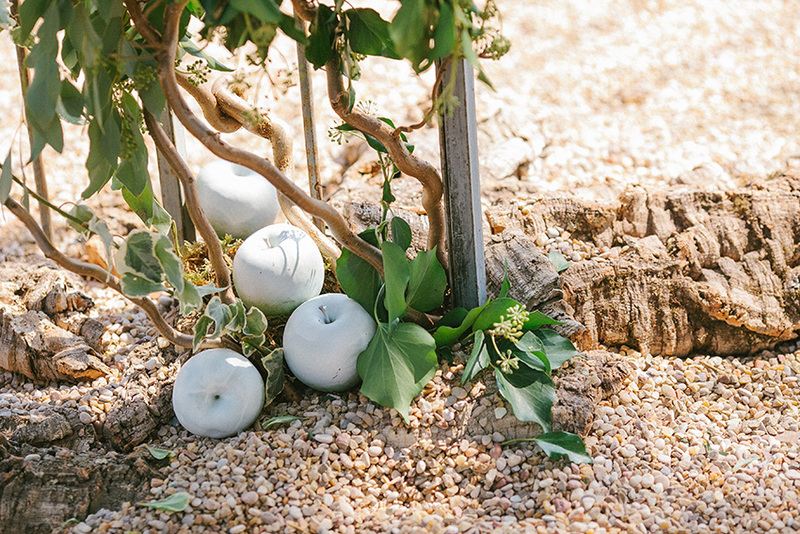 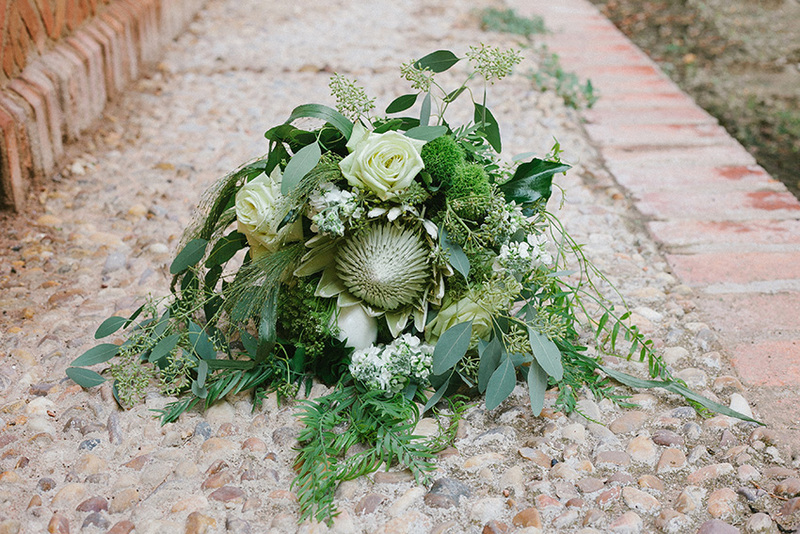 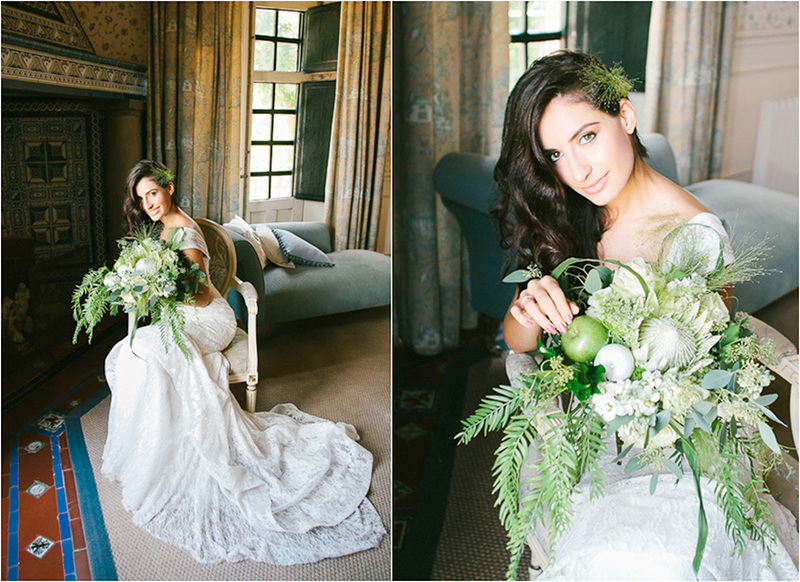 This bride broke traditions with a larger than usual bouquet, made up of wild flowers and plants in white and green tones, and touches of fruit such as apples, which brought life, freshness and originality to the bouquet! 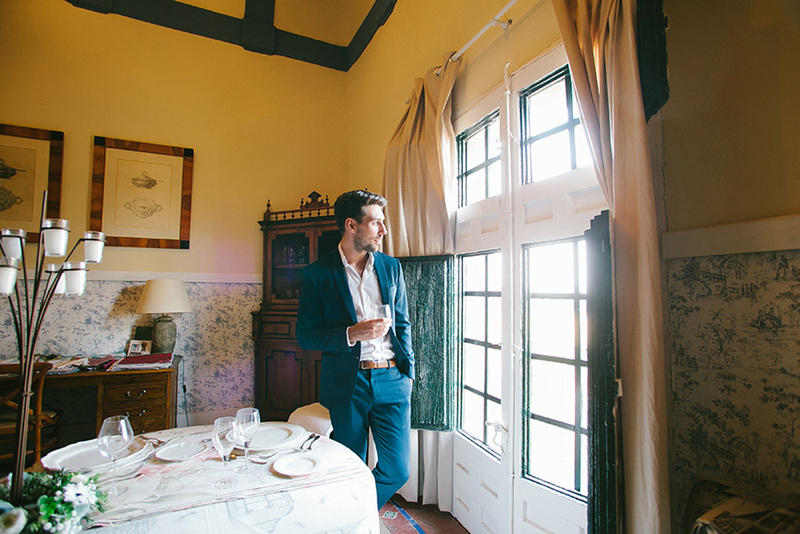 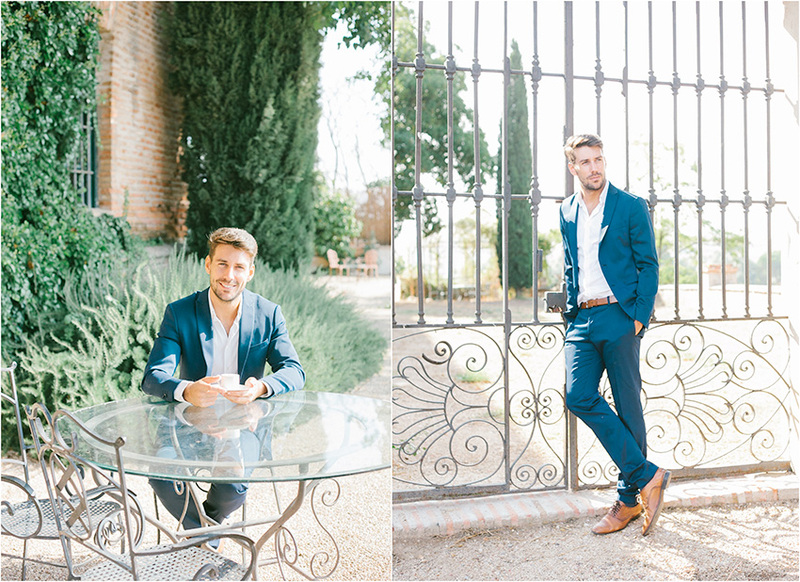 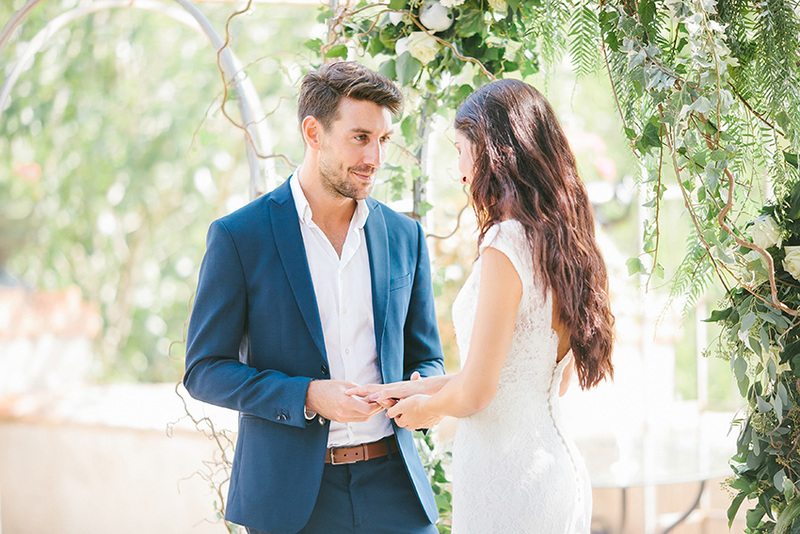 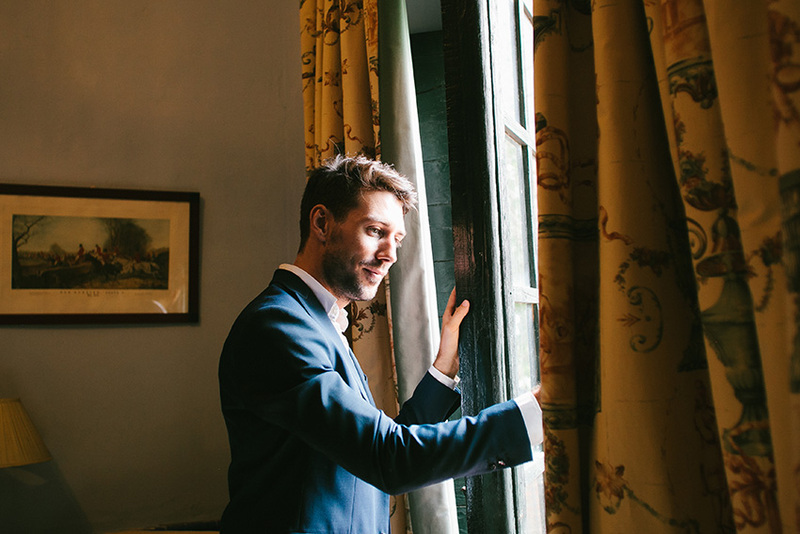 The groom opted for a simple and classic dark blue suit with a plain white shirt; an ideal outfit for this special moment. 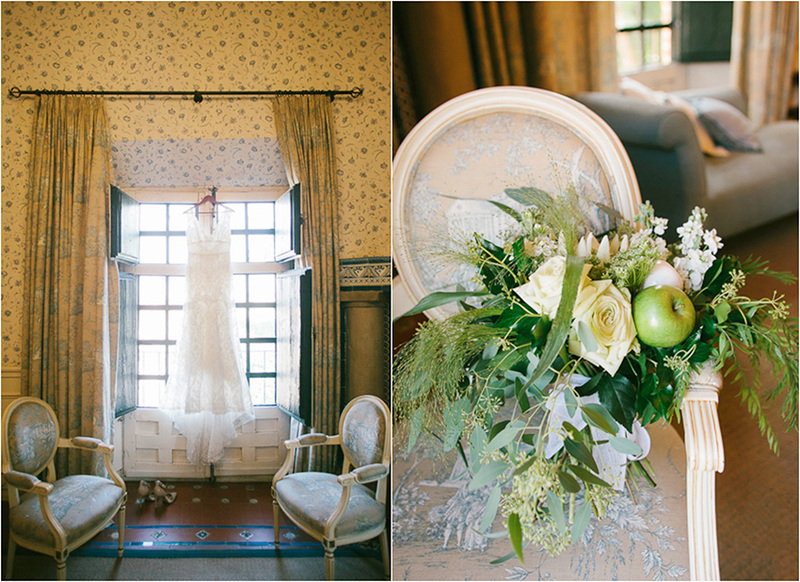 For the ceremony, the choice of bow was determined by the bride’s bouquet. 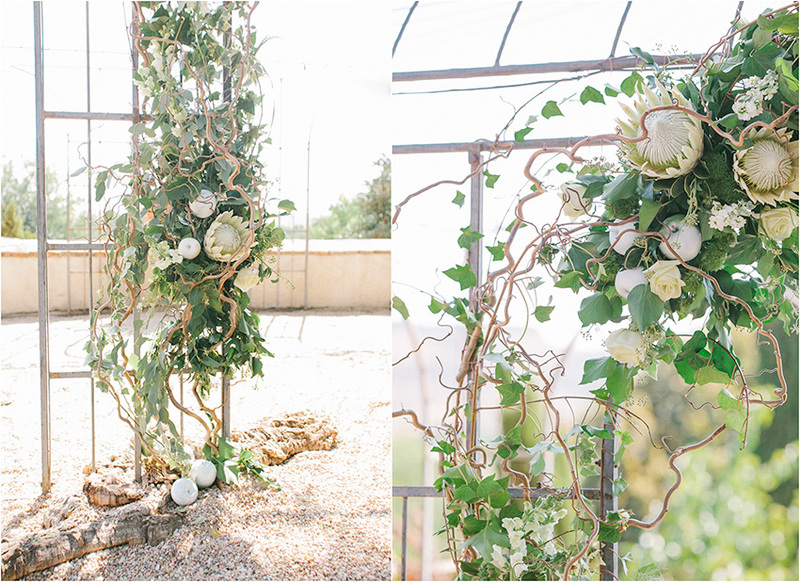 It featured an irregular arch formed by flowers and fresh plants that brought an element of simplicity and harmony to the room. 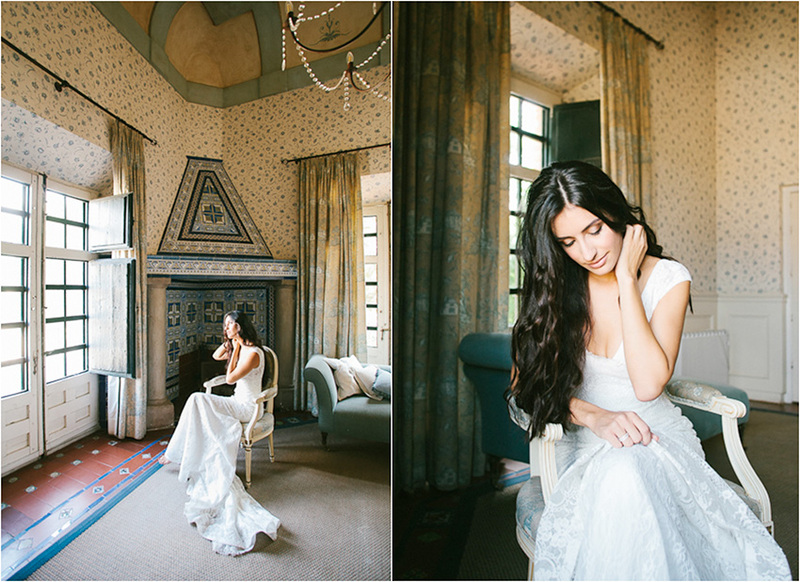 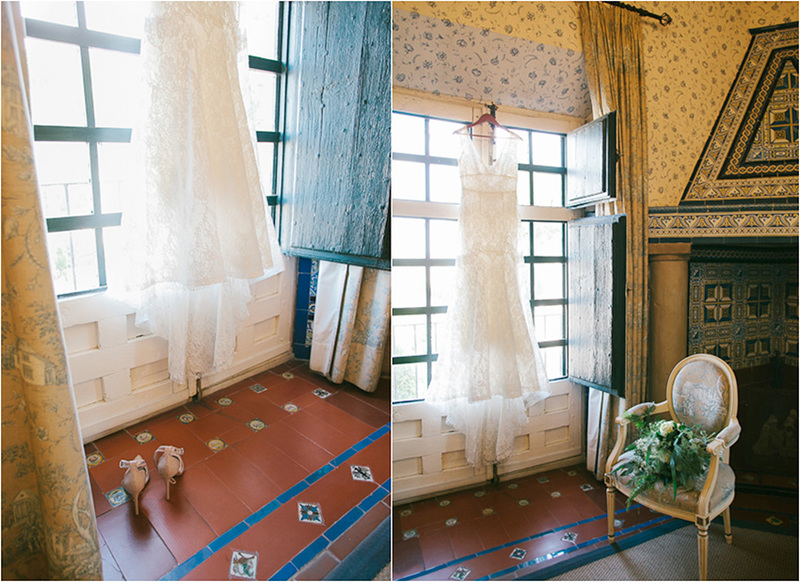 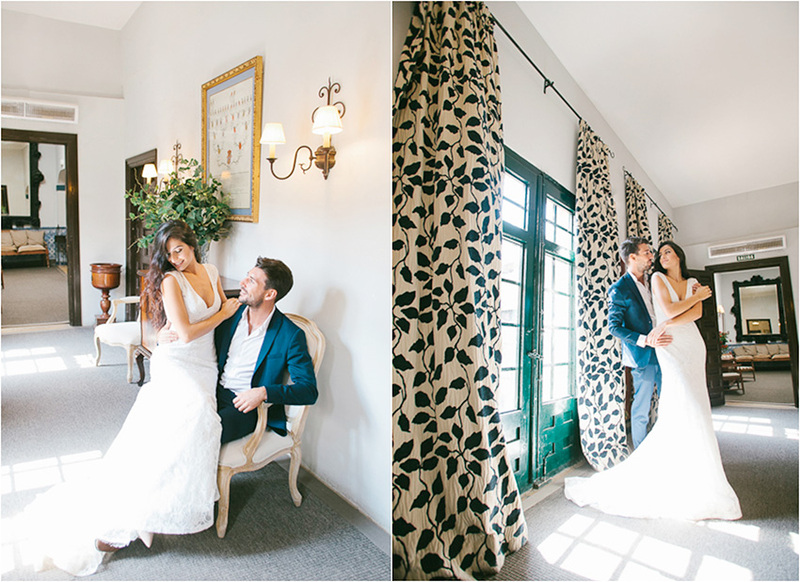 The beautiful castle, the bride and groom, and the decoration all blended perfectly. 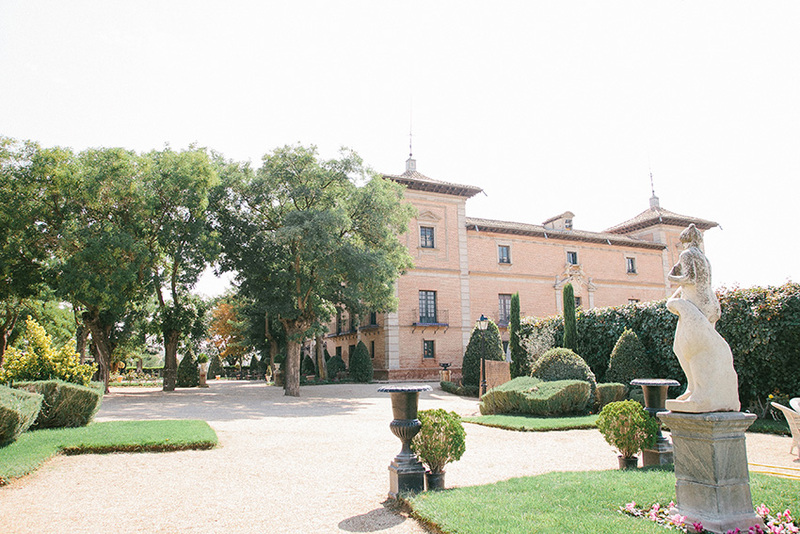 This palace is a very special place for any couple to feel comfortably enclosed in their own walls and gardens. 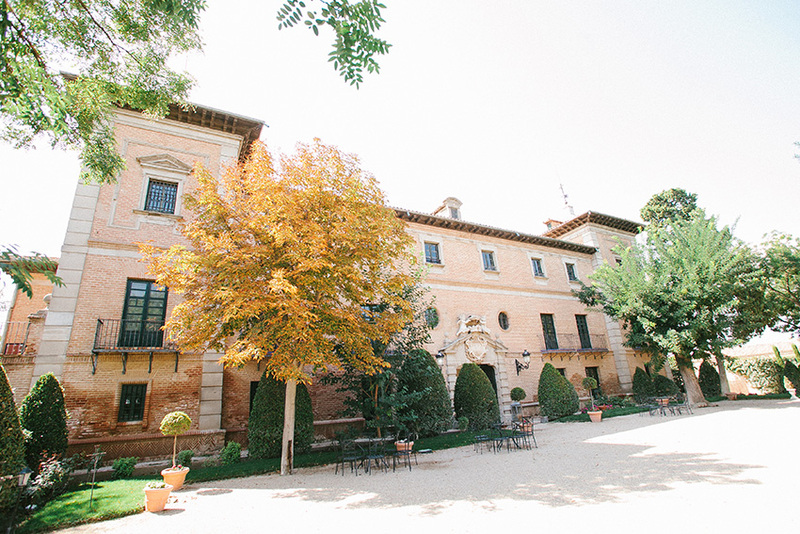 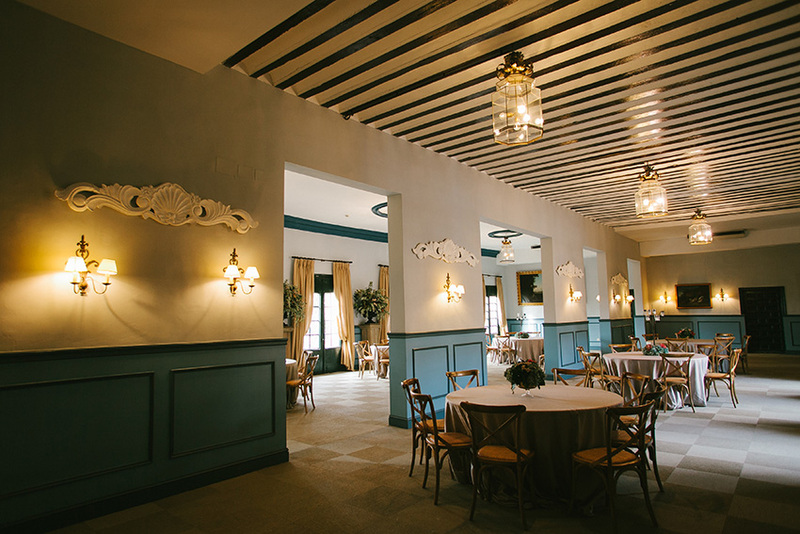 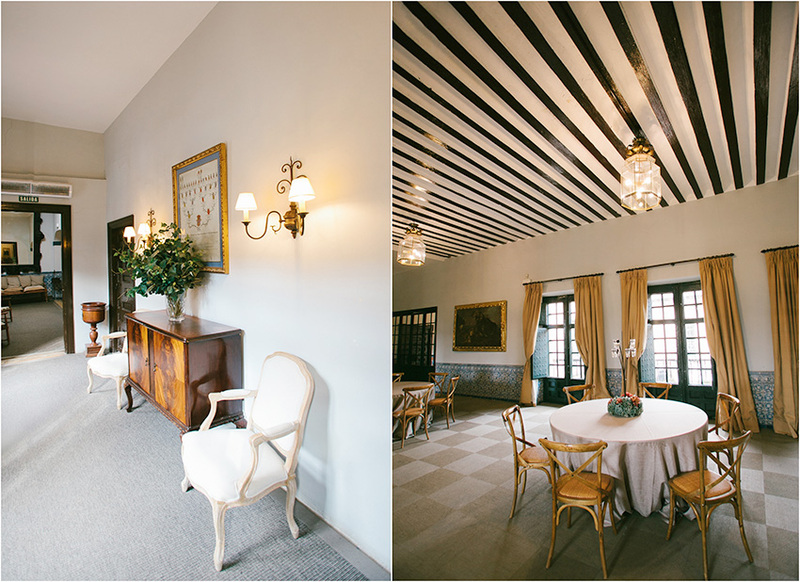 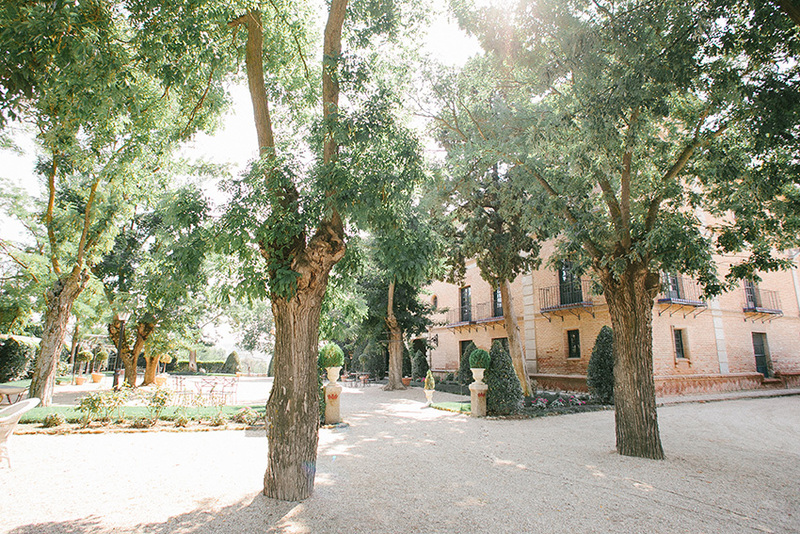 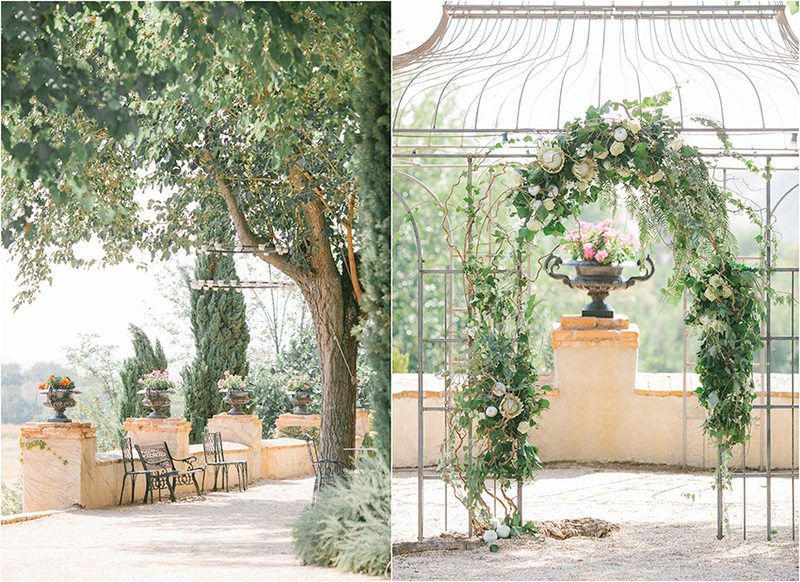 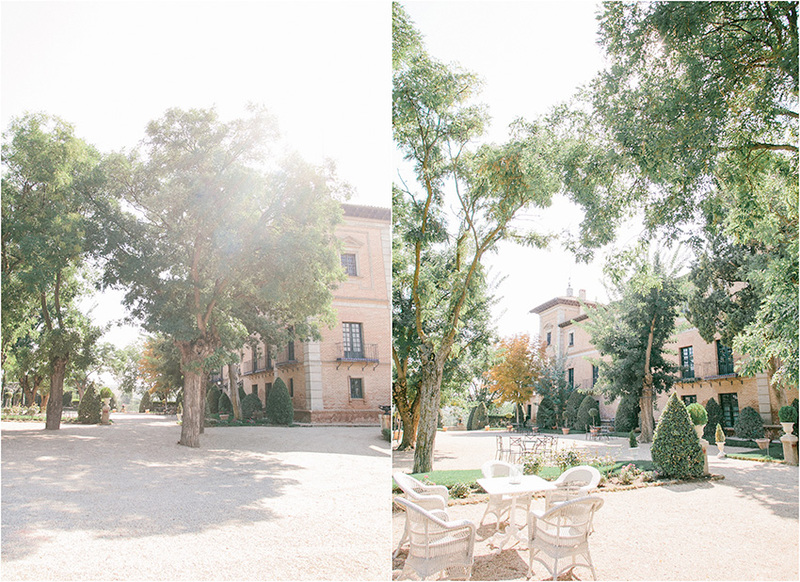 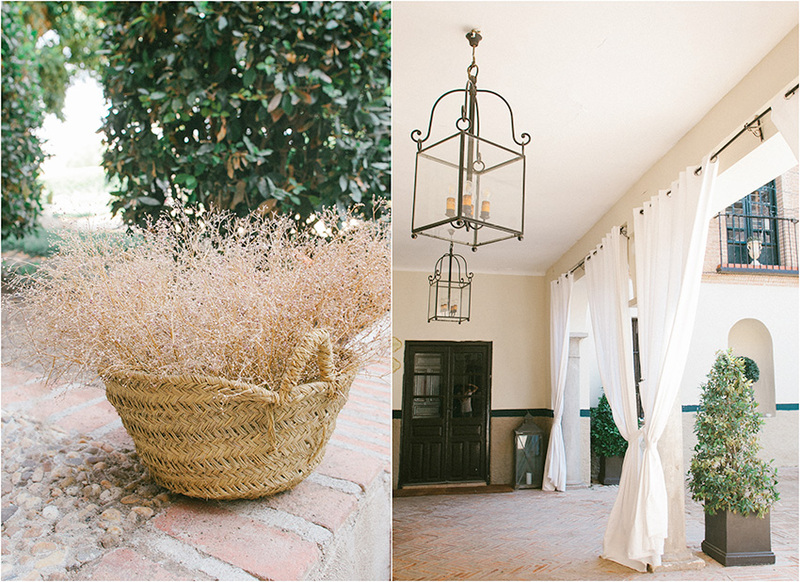 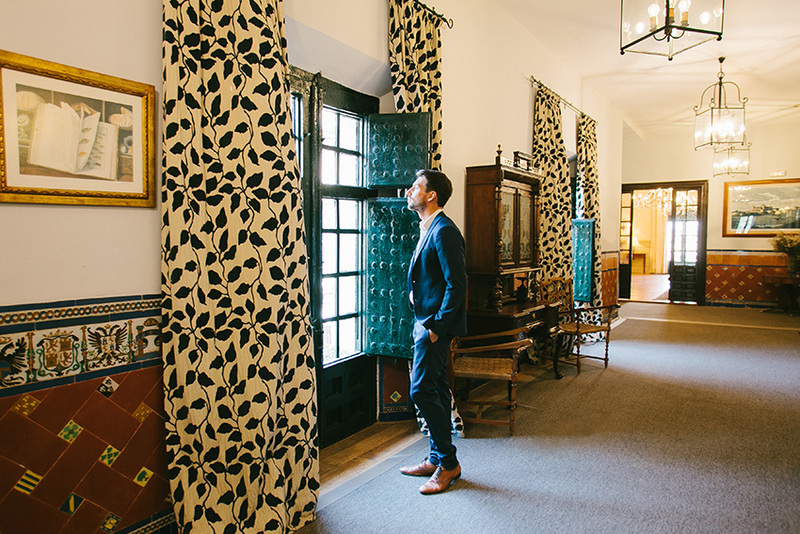 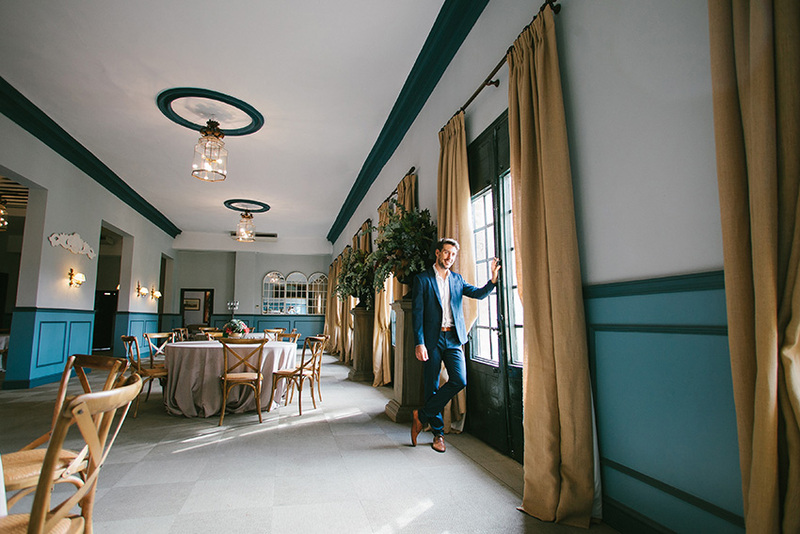 Celebrating a wedding in the Palace of Aldovea goes hand in hand with success, thanks to its unique space which allows for beautiful decoration, personal essence and corners full of magic. 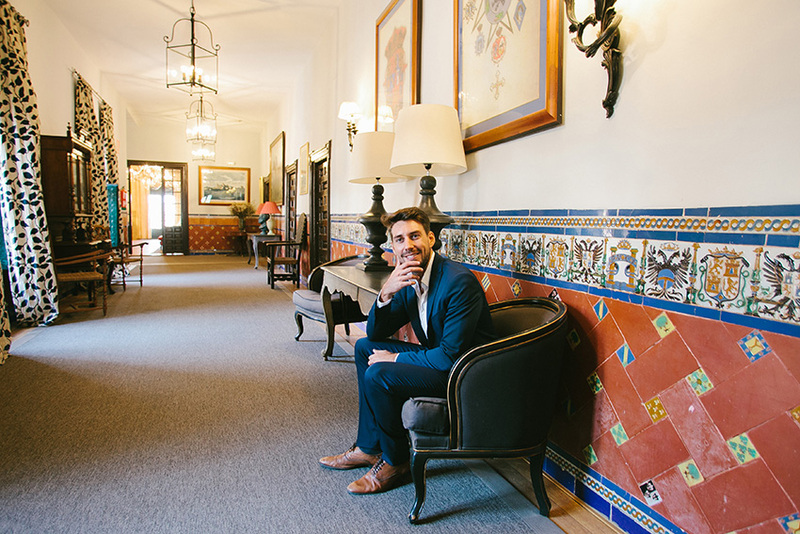 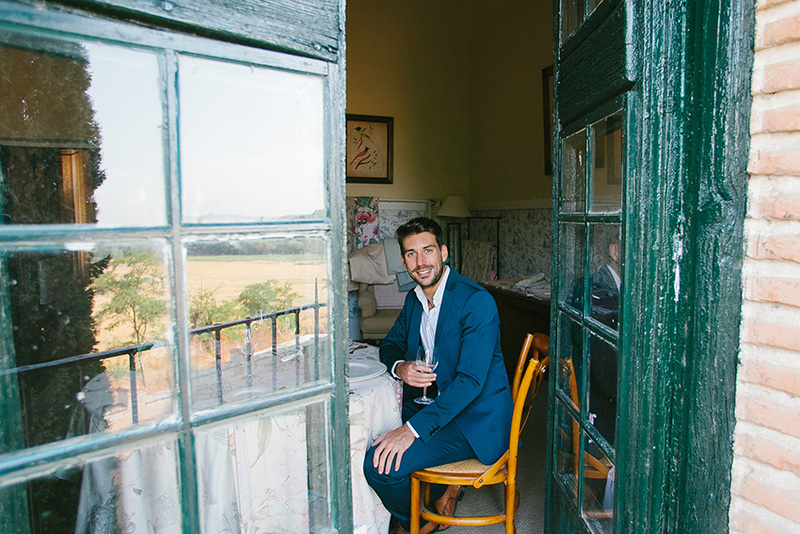 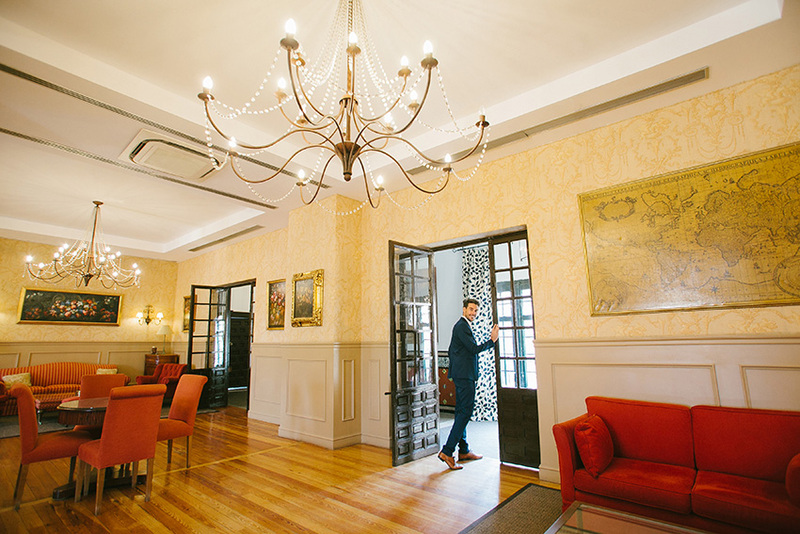 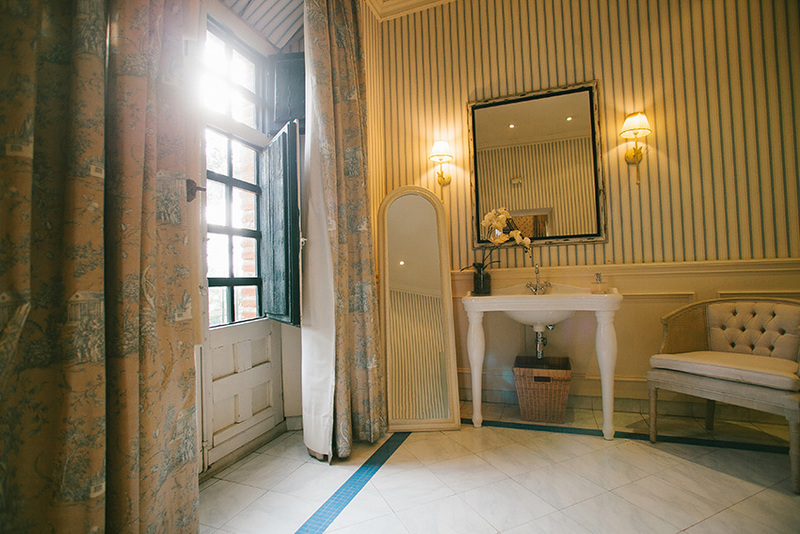 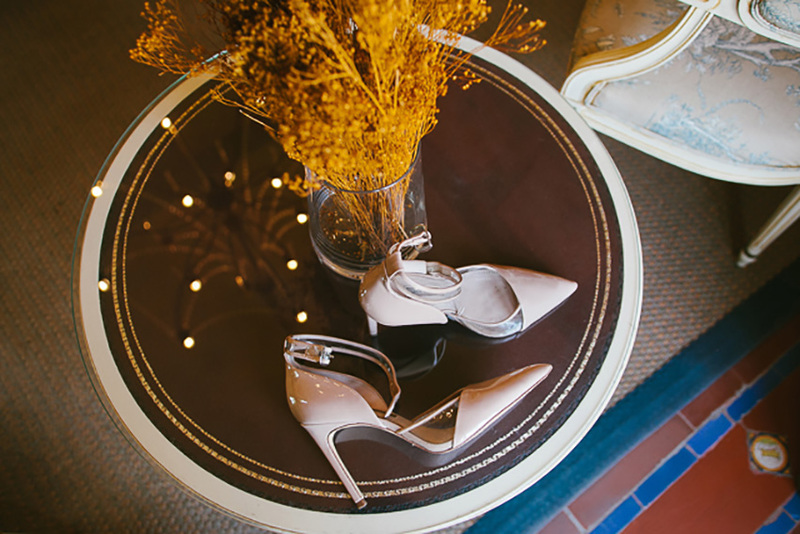 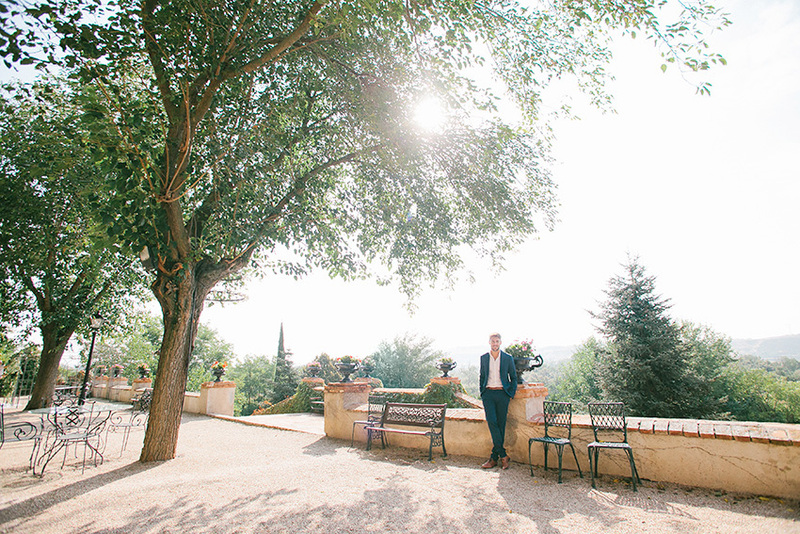 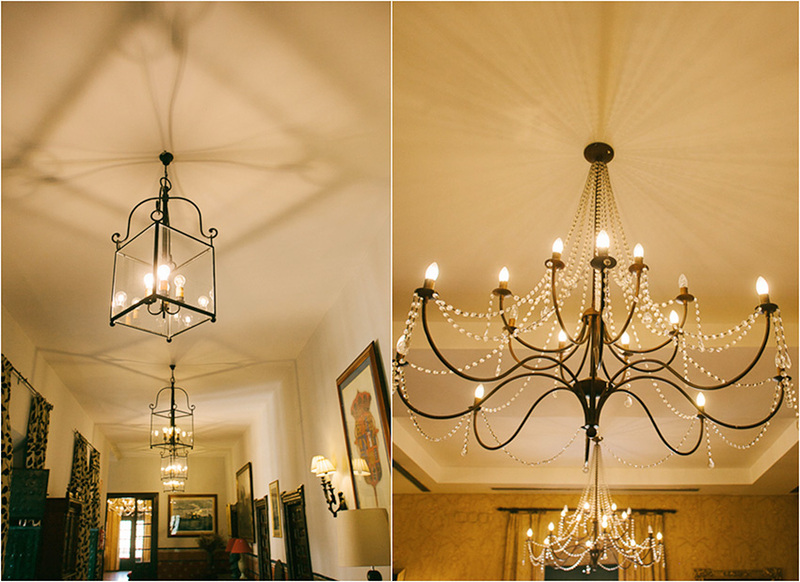 From the interior and exterior courtyards, to the bride’s room, as well as the numerous spacious rooms…we have no doubt that you’ll feel like a princess here!